We are delighted to introduce you to Lincoln, isn't he great? Lincoln is 13" tall and is made of lovely moss green German alpaca, really soft and very very thick. We have combined this with deep dark brown Schulte mohair for his body, ears, the backs of his paws and his feet. This fur has a much longer pile length and it gives Lincoln lovely fluffy feet and a great tummy. The contrast of the colours and textures really works well. Lincoln is filled with glass beads for weight and rubber pellets for extra cuddliness! He has bent legs which make him ideal for sitting on the edge of a table or shelf, long curved arms, a big round belly and quite a long snout. 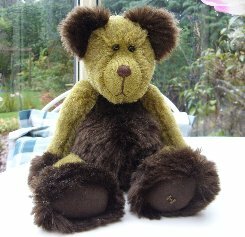 His eyes are shiny black German glass eyes and he has a dark brown stitched nose, his pads and paws are dark brown ultrasuede and he has a small round belly button. As you can probably tell, I really love this bear, he is so cuddly and soft. I hope you like him too, he costs £87.50 plus postage. Please note that as with all our bears, Lincoln is not a toy and is not suitable for children. Sorry - Lincoln has been adopted.